We think that people like staying here because it's comfortable with good food, friendly, welcoming local staff, great views and it's an interesting house to stay in. 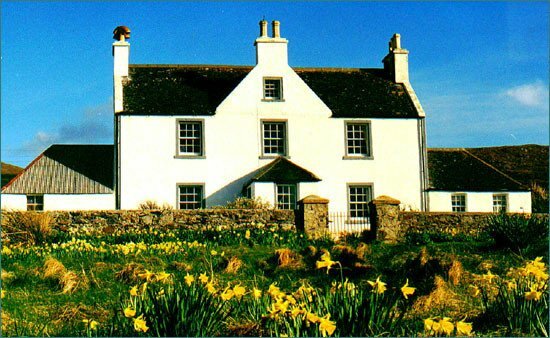 The house was formerly the manse for the Church of Scotland and it has a lovely welcoming atmosphere. The brave will swim in the sea opposite, there is a golf course just up the hill from us, but most people come here to walk, potter about, catch up on books they've been meaning to read for ages and generally do nothing. A buffet of fresh fruits, fruit compote, our own organic museli, homemade yoghurt, freshly sqeezed orange juice and hot food to order which includes bacon from Ramsay of Carluke, Stornoway black pudding, local sausages, tomatoes, mushrooms, local eggs, kippers and Loch Duart hot-smoked salmon.